Mayo 0-12 NUIG 1-6 (MacHale Park, 10/1/2014). 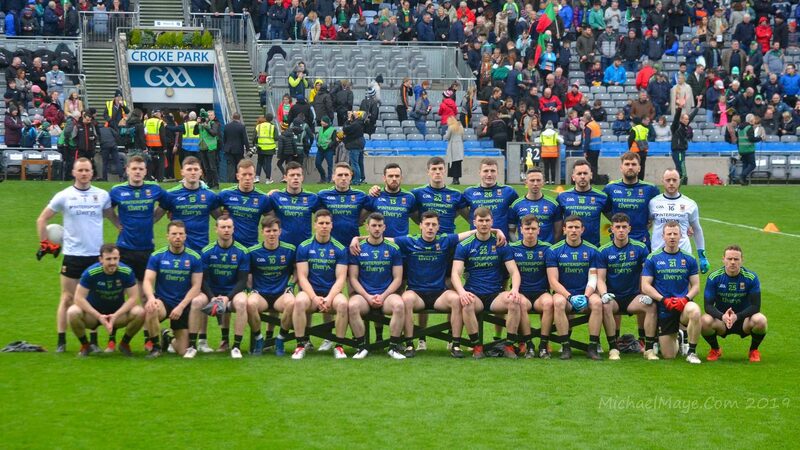 MAYO: Robert Hennelly (0-2, ’45s); Keith Rogers (0-1), Kevin Keane, Eoghan Reilly; Brendan Harrison (0-1), Shane McHale, David Drake; Jason Gibbons, John Reilly; Adam Gallagher, Cathal Freeman, Diarmuid O’Connor; Tom King (0-1), Darren Coen (0-5, three frees), Mikie Sweeney (0-1). Subs: Stephen Coen for Harrison, Brian Gallagher for O’Connor, Andy Moran for Sweeney, Sean Kelly for Gallagher, Colm Boyle for Keane, Michael Conroy (0-1) for Kelly (black card). Mayo 2-8 IT Sligo 1-11 (Connacht Centre of Excellence, Bekan, 12/1/2014). MAYO: Brendan Walsh; Keith Rogers, Kevin Keane, Ger Cafferkey; Brendan Harrison, Shane McHale, David Drake; Jason Gibbons, Brian Gallagher (0-2); Sean Kelly, Cathal Freeman, Cathal Carolan (1-1); Kevin McLoughlin (0-3, two frees), Darren Coen (0-2, one free), Andy Moran. Subs: Jason Doherty for McLoughlin (black card), Michael Conroy for Moran, Lee Keegan for Keane (black card), Enda Varley for Conroy, Alan Freeman (1-0, penalty) for Kelly. Roscommon 1-10 Mayo 1-8 (Ballinlough, 19/1/2014). MAYO: Robert Hennelly; Kevin Keane, Ger Cafferkey, Colm Boyle; Brendan Harrison, Shane McHale, David Drake; Tom Parsons, Aidan O’Shea; Diarmuid O’Connor, Andy Moran (0-2), Adam Gallagher (1-2); Kevin McLoughlin (0-1, free), Alan Freeman (0-1, free), Jason Doherty (0-2). Subs: Keith Higgins for O’Connor, Enda Varley for McLoughlin, Jason Gibbons for Parsons, Cathal Carolan for Moran. PRELIMINARY ROUND: Mayo 1-8 Roscommon 4-10 (MacHale Park, 12/3/2014). MAYO: Matthew Flanagan; Kevin Lynch, Liam Kitterick, Aidan Butler; Cian Burke, Stephen Coen, Padraig O’Hora; Padraic Prendergast, Diarmuid O’Connor (0-1); Gareth O’Donnell, Michael Plunkett, Adam Gallagher (0-1); James Shaughnessy (0-1), Evan Regan (1-3, two frees), Conor O’Shea (0-1). Subs: Eoghan Collins (0-1) for O’Hora, Steven Conroy for Plunkett; Anthony Jordan for Prendergast; Michael Hall for Burke (black card), Sean Regan for Shaughnessy. SEMI-FINAL: Galway 1-12 Mayo 3-7 (Tuam Stadium, 28/6/2014). MAYO: Matthew Flanagan; Mikey Barrett, Barry Duffy, Eoin O’Donoghue; Jason Forkan, Sean Conlon, Conor Kilkenny; Gary Walsh (1-0), Matthew Ruane (0-1); Sharoize Akram, Cian Hanley (1-4, penalty goal and three frees), Oisin Horan (0-1); Conor Byrne, TJ Byrne (0-1), Brian Reape. Subs: Stephen Brennan, Fionan Duffy, Liam Byrne (1-0), Jack Reilly. FINAL: Mayo 2-16 Roscommon 0-14 (MacHale Park, 13/7/2014). MAYO: Matthew Flanagan; Seamus Cunniffe, Barry Duffy, Eoin O’Donoghue; Jason Forkan, Sean Conlon, Stephen Brennan; Gary Walsh, Matthew Ruane; Sharoize Akram, Cian Hanley (1-2), Gary Boylan (0-2, one free); Conor Byrne (0-2), TJ Byrne (0-1), Brian Reape (1-6). Subs: Conor Kilkenny (0-1) for Ruane, Fionan Duffy (0-2) for Conor Byrne, Keith Hopkins for Duffy, Matthew Ruane for Walsh. QUARTER-FINAL: Mayo 3-13 Armagh 0-9 (Croke Park, 3/8/2014). MAYO: Matthew Flanagan; Conor Kilkenny, Seamus Cunniffe, Eoin O’Donoghue; Jason Forkan, Barry Duffy (0-1), Sean Conlon (0-1); Gary Walsh, Matthew Ruane (0-1); Gary Boylan (0-1), Cian Hanley (0-3, one free), Sharoize Akram; Fionan Duffy (1-2), T J Byrne (0-1), Brian Reape (2-1). Subs: Conor Byrne (0-1) for Boylan, Stephen Brennan for Kilkenny, David Clarke for Forkan, Liam Byrne for Duffy, Oisin Horan (0-1) for Conlon, Keith Hopkins for Walsh. SEMI-FINAL: Kerry 1-14 Mayo 2-7 (Croke Park, 24/8/2014). MAYO: Matthew Flanagan; Conor Kilkenny, Seamus Cunniffe, Eoin O’Donoghue; Jason Forkan, Barry Duffy, Sean Conlon; Gary Walsh, Matthew Ruane; Gary Boylan (0-4, three frees), Cian Hanley (0-2), Sharoize Akram; Fionan Duffy (0-1), TJ Byrne (2-0), Brian Reape (0-1). Subs: Liam Byrne for Hanley (inj); Stephen Brennan for Kilkenny (black card), David Clarke for Forkan; Keith Hopkins for Ruane (inj); Jack Reilly for Duffy; Dylan Cannon for Conlon.